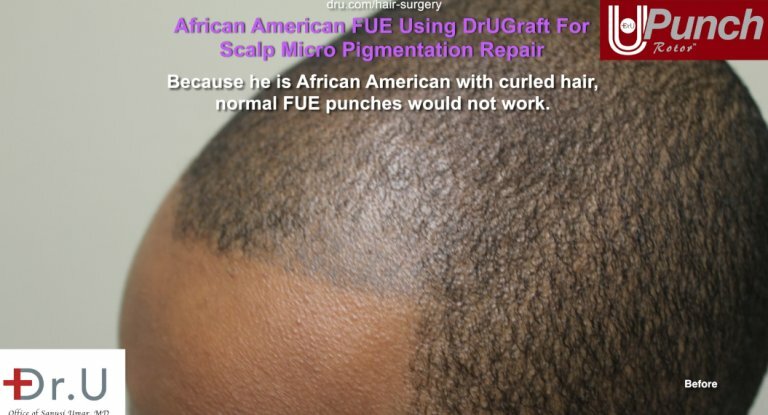 In the next case, Dr. Umar performed a bad hair tattoo repair with a FUE hair transplant using his unique Dr.UGraft technique on an African American individual from Los Angeles, CA. 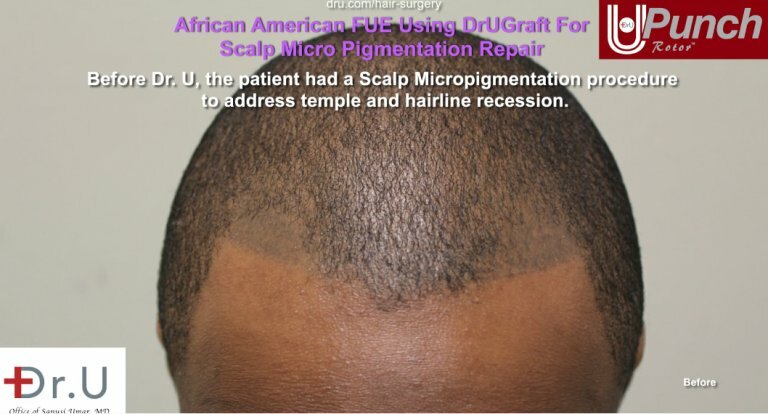 The patient had previously experienced a scalp micropigmentation (SMP) in an attempt to restore his hairline and temples. The patient has been unhappy with the outcomes of the SMP for 2 reasons: 1) the pigment was put in his receding temples, causing a noticeable difference in textures two) the pigment had been deposited to deep which turns blue or green. This caused his SMP to look extremely unrealistic. As an African-American, he did not believe he would be a candidate for a hair transplant. Unhappy with his physical appearance, he scheduled a consultation with Dr. Umar to investigate his options for fixing his botched tattooed hairline. Dr. Umar used his patented Dr.UPunch Rotor to carry out a FUE hair transplant on the patient. Since the patient is African with curly hair, he wouldn’t be an appropriate candidate for a conventional FUE hair transplant, which could be effectively performed on patients with hair that is wavy or straight. In contrast the revolutionary Dr.UPunch tool permits for FUE on all hair types. 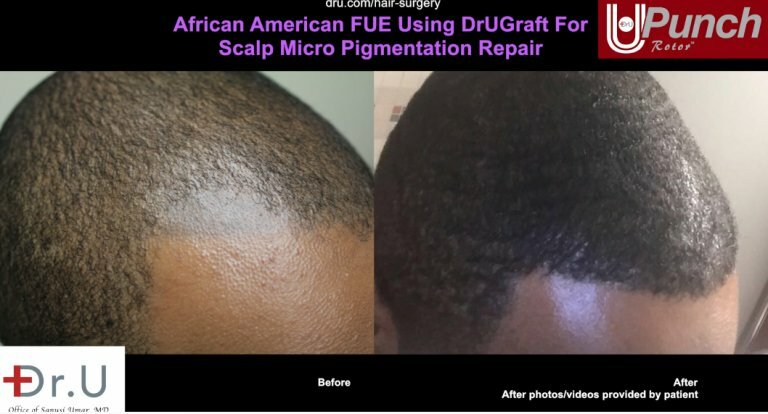 Dr. Umar utilized his Dr.UGraft Revolution system to not only repair the awful hair tattoo, but also restore the patient’s hairline… all with just 1375 grafts. After years of frustration the individual was very happy with his results. For More Information About This Bad Hair Tattoo Patient CLICK HERE. This speaks for itself. Dr. Umar is the only doctor who can do this type of transformation. The man is a miracle worker, and saved me from 4 disastrous, malpracticed procedures.